England and Durham cricketer Ben Stokes, 26, leaves Bristol Magistrates' Court where he was told he will face a crown court trial over an altercation outside a nightclub. Photo by the Press Association. England cricketer Ben Stokes will go on trial at a crown court over an disturbance outside a nightclub. The 26-year-old Durham all-rounder - who missed the Ashes after being suspended from playing for England - is accused of affray along with with two other men. Stokes appeared at Bristol Magistrates' Court on this morning alongside Ryan Ali, 28, and Ryan Hale, 26. It follows the altercation in the Clifton Triangle area of Bristol during the early hours of September 25 last year - several hours after England had played a one-day international against the West Indies in the city. The full charge sheet shows that Stokes, of Castle Eden, near Peterlee, is accused of affray on the September 25 at Queens Road in Bristol. The charge states that his "conduct was such as would cause a person of reasonable firmness present at the scene to fear for his personal safety". Affray is an either way offence meaning it can be tried at the magistrates court or the crown court. 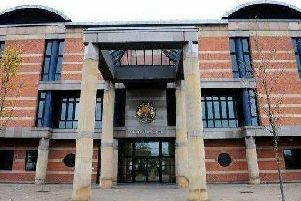 But all three defendants elected to be tried by a jury at the crown court. District Judge Simon Cooper told the three defendants: "I have decided that your trial will take place at the crown court at Bristol. The first hearing date will be March 12. You will be on bail." In a statement posted on Twitter last month after he was charged, Stokes said he was "keen to have an opportunity to clear my name". Avon and Somerset Police said no action has been taken against a 27-year-old man who previously voluntarily attended a police station for interview. It is a triable either-way offence, which means it could have be heard in either the magistrates' court or the Crown Court. It carries a maximum penalty when tried summarily - in the magistrates' court - of a fine or up to six months in prison, and when tried on indictment - in the Crown Court - of up to three years in prison. While England were in Australia, Stokes played a few games for Canterbury Kings during a month-long spell in New Zealand before returning home to England. Stokes could make his England return in the one-day series against New Zealand which begins on February 25 after being included in a 15-man squad. He is due to play in the Indian Premier League after being sold for £1.4 million to the Rajasthan Royals.